For me, there is nothing better than a new journal. Cracking it open for the first, a blank page to write my stories. The amazing feeling that I can start all over with new positive energy and dreams. I honestly can’t remember not having a journal. When I was a young girl, someone read my journal. GASP! I was devastated. It was as though they had read and learned all my secrets that were just meant for me. After that day, I continued to write, but it became filtered writing out of fear that someone would read it. It didn’t have the same feeling anymore. It wasn’t until my life coach training that I bought a new journal, along with a few of the women in my class. We talked about how we all filtered what we wrote out of fear that someone would read it. How useful is this writing if it is filtered? We all agreed that we had to change and get back to writing in a way that would connect us to our hearts. That afternoon, we all made a pact that we would start writing, filter free. 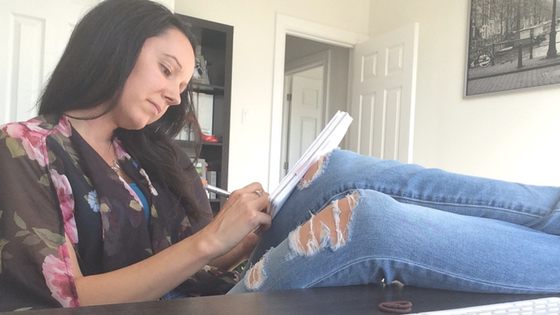 Journaling became my little black-booked therapist. It became the place where I could share my stories, express my feelings, good and bad, and have a place to work through negative thoughts and emotions. When I’m upset, confused, sad, anxious, I open my book before talking to anyone else. Sometimes all that is needed is the release. The journal is usually where I get the answers that I’m looking for. “What should I do? What should I say? What should I write? Where would you have me go? Who would you have me be?” The simple act of writing those questions allows the fog to lift and clarity (the answers) to appear. Maybe not right in the moment, but at some point in the day, the answers will come. Writing out my feelings has always been my way of releasing all the emotions that I sometimes can’t say verbally because it feels like there are no words unless I have the pen in my hand. Most times, after I put down the pen, I feel lighter. I believe it is because journaling can make space in your mind, your heart and your soul (the power of three) for new experiences and positive thoughts to come through. That can’t happen when your mind is full of negative thoughts and built up limiting beliefs or even anger towards someone. You have to put those feelings somewhere. If you keep them inside of you, they will fester and grow, leaving no space for any of the goodness that you want to have come into your life. It isn’t just about putting your negative emotions somewhere, it is also an amazing tool for sharing your desires, goals and intentions for the day. I start every day by writing something, even if I don’t have anything to write, I just write what I’m grateful for. There is something about the connection between our heart, the pen and the paper. It opens us up. It busts open our heart. It clears our mind. Every morning, I will free-write for 5 minutes and let the thoughts flow. Then I feel ready to start the day with positive intentions and a clear mind. Don’t just take my word for it. Test it for yourself. If you think journaling is for you, grab a beautiful book, your favourite pen, and start your journey to connecting with your heart, your mind, and your soul.